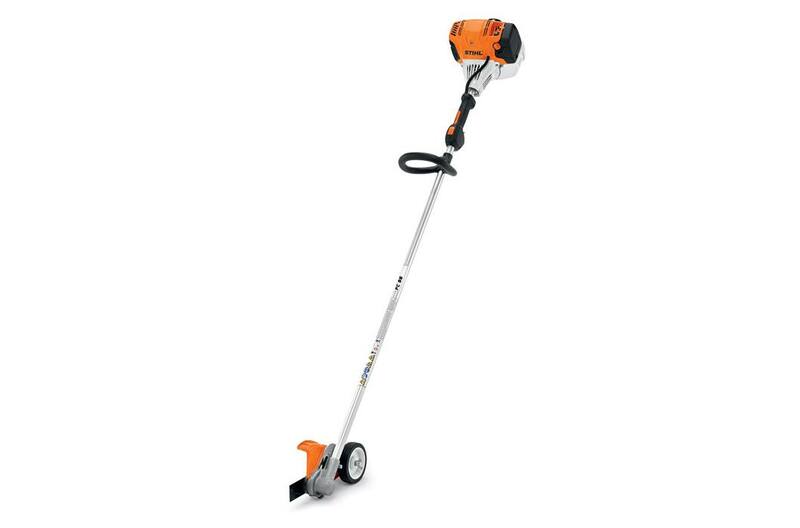 The STIHL FC 96 professional edger doesn’t just clean up edges in your landscape, it cuts you a new one. The FC 96 has all the hardworking features of the FC 95 but has more power. Featuring a low-emission engine, it has a larger fuel tank providing 30% longer run times than the previous model. So whether you’re touching up existing walkways or creating new lines in dense, compacted soil, this edger helps you achieve a clean, finished appearance. It even features a vertical pleated paper air filter for extended service intervals, one touch stop and an easy three-step start procedure enabled by the semi-automatic choke lever. When you need a powerful edger, the FC 96 will give you the edge you’re looking for. "Line of Sight" Marking: A notch on top of the edger’s guard helps guide the user during use, allowing for increased control and helping to create cleaner, more precise cuts. "Open" Guard Design: The professional “open” guard design helps minimize clogging, allowing for more efficient cutting. Adjustable depth wheel: The adjustable depth wheel allows user to control the depth of the cut.